Laugardalsvöllur is the national sports stadium of Iceland, and is used to host the home matches of Icelandic National Football Team since opening in 1958. 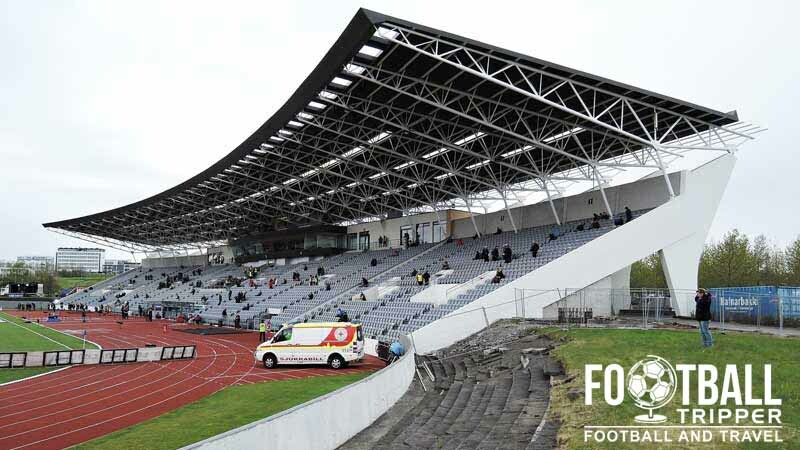 Iceland’s national stadium for many years consisted of a single stand until it was joined by an opposite one in 1997. The main stand which overlooked the athletics track and pitch was renovated in 2006 resulting in a more modern aesthetic including a fully cantilevered roof. With Iceland’s relatively small population there has yet to be the need for further expansion and thus the capacity of Laugardalsvöllur remains around 15,000. In the past the capacity has been increased with the addition of two temporary stands behind the two vacant goal-ends which resulted in a capacity increase of 3,000. To date the record attendance was set on 18th August 2004 when Iceland hosted a star studded Italy side. Played out infront of a crowd of 20,204 before the old main stand was modernised, Iceland defeated their much favoured visitors 2-0 with former Chelsea striker Eiður Guðjohnsen scoring the first goal. As of 2015, Iceland have yet to qualify for a major international tournament with the small country yet to qualify for either a World Cup or European Championship to date. Leading the table with three games to go there is however a strong possibility that Iceland will qualify for Euro 2016 in France. Away Fans are housed within the northernmost part of the east stand which is the newer of the two seating sections. Typically the travelling supporters occupy seating sections J, K, and L which can be accessed through the northern entrance (Nordijr Inngangur). There aren’t really any places to drink immediately around the stadium, although the city centre more than has you covered. Unfortunately you won’t find a permanent club shop at Laugardalsvöllur with the small merchandising stalls located outside the main stand only set up on matchdays. 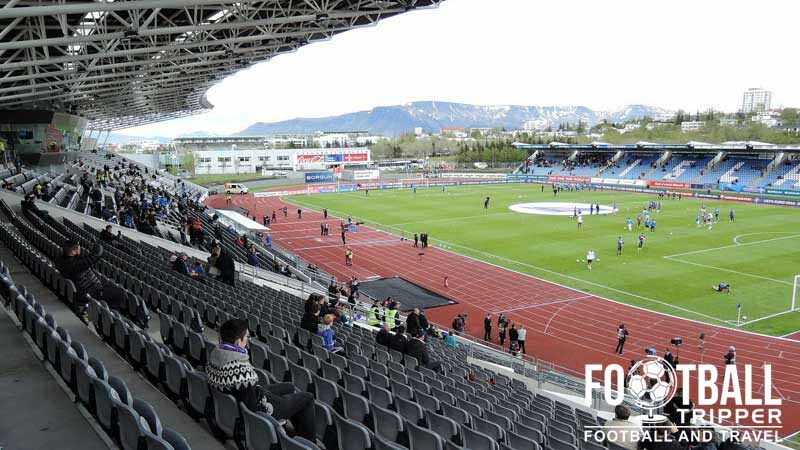 There isn’t currently a stadium tour available of Iceland’s national stadium as there isn’t really anything you couldn’t see when you watch a match. If the tour situation at Laugardalsvöllur changes in the future we’ll be sure to update this section. Tickets to see Iceland in an International match should be purchased in advance through the Icelandic FA’s website or if you wish to travel with your country, through your own football association/federation. 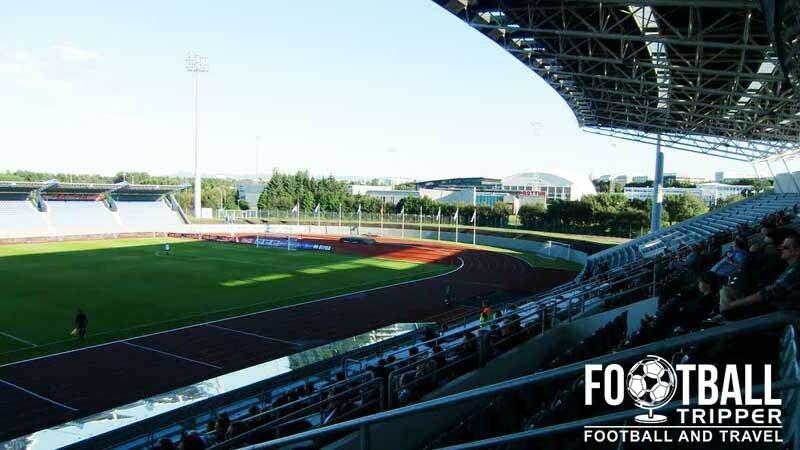 For domestic matches of Fram Reykjavík you can purchase tickets on the day of the match from either of the ticket office either side of the main entrance in the west stand. Expect to pay anywhere between 1,200 – 1,600 ISK for a ticket which equates to around 10 euros. Laugardalsvöllur sits within a wider sports complex which houses the national training facilities approximately 20-40 minutes walk depending on your starting location. 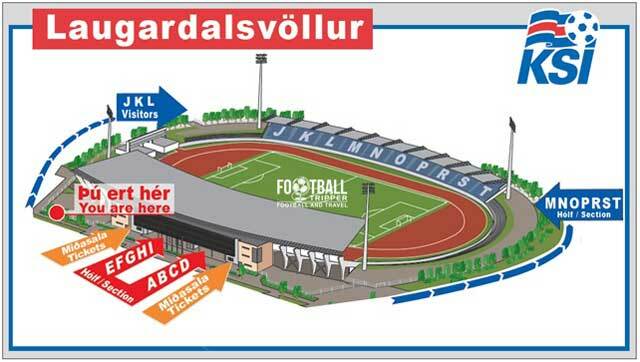 The scoreboard inside Laugardalsvöllur also doubles as an entrance sign for the stadium due to its unenclosed nature. The sports complex in which Iceland’s stadium sits is blessed with three medium sized car parks which are capable of accommodating the majority of matchday visitors. Laugardalsvöllur isn’t blessed with its own bus, metro or train station which means public transport for the most part is off limits. 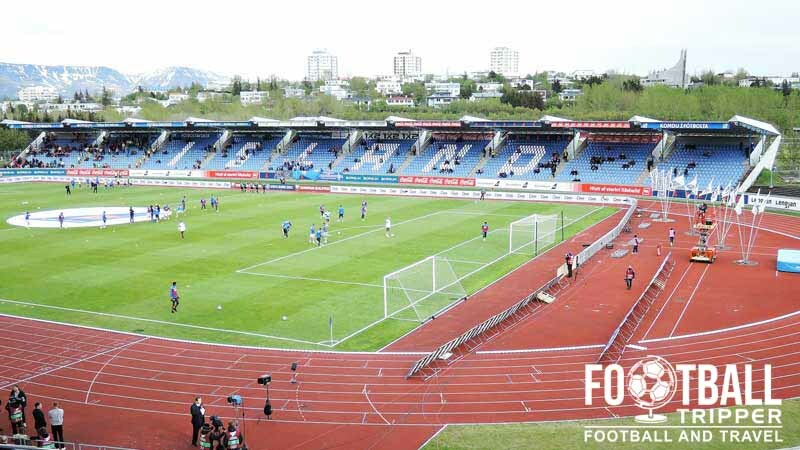 Some fans recommend catching bus numbers 2, 17 or 19 from Hlemmur bus terminal four stops away to Laugardalshöll, which can take you within a reasonable walking distance of the ground. The main stand of Laugardalsvöllur is certainly an impressive site in the flesh, especially in relation to the opposite east stand which is much smaller. Reykjavik has its own airport however it is predominantly used for domestic flights and services to the Faroe Islands and Greenland. Keflavík International Airport 50k south-west of Reykjavik is the main flight hope if Iceland. Hotels within Iceland’s capital are generally speaking quite expensive and thus it can be hard to find anything below the 50.00 euro per night mark. The closest options to Laugardalsvöllur include Hotel Bjork, Hotel Island and Reykjavik Lights Hotel with plenty more options back towards the city centre.